Beadalon Flexible Jewellery Wire, suitable for many types of jewellery projects such as stringing beads, crimping beads, creating hoops and much more. 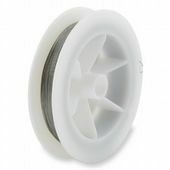 Beadalon Flexible jewellery wire comes in a variety of thicknesses. We stock 0.012" (0.30mm), 0.015" (0.38mm) and 0.018" (0.46mm).